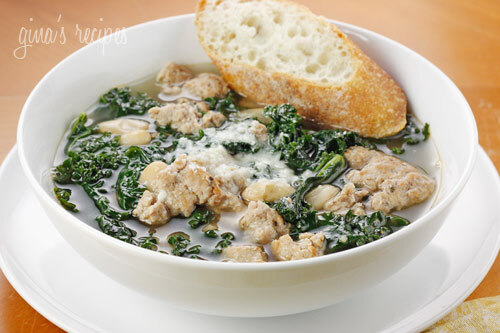 This hearty turkey sausage, kale and white bean soup is loaded with fiber and is a very satisfying meal on a chilly evening. Top this with some good grated cheese like Parmigiano Reggianno or Locatelli (I always splurge on grated cheese) and a nice piece of crusty bread for a wonderful meal for 4 under $10. Heat oil over medium-high heat in a medium sized pot. Add sausage meat breaking it up with a spatula or wooden spoon into large chunks. When completely cooked, add garlic and saute for 2 – 3 minutes (careful not to let the garlic burn). Add the water, stock, beans and red pepper flakes (if using) and stir thoroughly. Simmer on low for 10 minutes, covered. Throw in kale and allow to simmer for another 10 minutes covered. Adjust salt and pepper to taste. Divide into four bowls and serve hot. Wow. This is excellent. The homemade sausage made it so flavorful. This was as close to perfect as it gets! I used spicy Italian sausage links and dried beans. I made it in the instant pot and it was DELICIOUS! Even the picky ones loved it! Thanks for a great recipe! Hi Gina! This isn’t updated for Freestyle Points. I assume you’d really only count the turkey and olive oil? I made it with 99% fat free so it’s almost free points! So good! I added more beans and sauteed mushrooms, but this was delicious!!! Do you know how many new points this would be? Looks great! I LOVE this soup. I did alter it a bit to make it go further/change the flavor a tad. I used 2 lbs turkey sausage, 2 cans beans (drained and rinsed), added a chopped onion (request from my boyfriend who would literally eat onions on ice cream). Also used 6 cups chicken bone broth (homemade) since I used more meat/beans, and instead of water, 1 can of lite coconut milk. The coconut milk gave it a little bit of a creamier texture and a hit of sweet to the taste – it was awesome! Also probably added more like 3-4 pinches of red pepper because I like its spicy 🙂 Already have the ingredients on my grocery list to make it again this week! This soup is great. Made it for the family. I made the turkey sausage from scratch using Gina’s recipe. I had a bag of chard, spinach and kale so I used that. Some of us added the locatelli and some of us put a few drops of Braggs liquid aminos to our bowls. Both versions tasted great. Served with a thin slice of crusty whole grain seeded bread loaf. Can you list directions to convert this recipe to be cooked in an instant pot? I would just use the soup button. 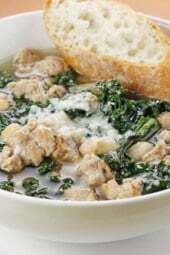 Can you provide the amart points for the Turkuy sausage, kale and white bean soup? Does anyone know how many Smart Points this is ? The info only has points+ value. THanks! I am making this now, with Butterball Hot Italian turkey sausage and a little extra fennel seed. My supermarket sells already cleaned and chopped kale so I eyeballed the amount. Very excited to eat dinner! Smells great!! This tastes exactly like Olive Garden's Zuppa Toscana Soup except the potatoes are replaced with beans. Very good, and the recipe is measured perfect! I absolutely loved this soup! I threw some celery and a small onion in there for more veggies. I also used pre cut kale in a bag because I'm lazy. This soup is filling, delicious, and healthy! I love your recipes! Just made this and my boyfriend who doesn't like beans at all LOVED it. I'm definitely going to make a big batch and freeze it. Thanks again for another winner Gina! This is a very tasty soup. We've made it 3 weeks in a row and headed for a fourth. I love this soup! Made it tonight and it was delicous! I used Andouille sausage and frozen kale. Since I wasn't using a low cal sausage, I used a half a pound instead, and balance the liquid ration. yummy. Just made this and it was soo delicious!!! Thank you for the recipe!!! I added onion to the sausage and a laurel leaf mistaking it with oregano… but delicioso!!! A mi familia le encanto! Making this right now. I had some mushrooms I had to use so I decided to throw it in there and use a whole bunch of kale instead of half because i love the stuff, so I increased the amount of broth/water. Don't think this will affect the amount calories per serving much. Can't wait to taste it. It smells wonderful! Can't wait to give this a go tomorrow! I heart kale. I made this tonight but used Premio Chicken Sausage instead. It was delish! Thanks! I modified this by using All Natural Al Fresca Sausage b/c I didn't have time to make the homemade stuff. So yummy! I am addicted to kale lately. I just made this for dinner, it was so delicious! Thanks for the great recipe! How can I reduce the sodium? Use unsalted broth and don't add any salt. Love your site!! Would the points+ be the same if I used Jennie O Sweet Italian Turkey Sausage without the casing instead of the homemade stuff? (I like as many shortcuts as possible). I've made this soup twice now. I just can't get enough! Wow. This was really good. And simple/quick. And healthy. I did add Parmesan at the end. And I think deglazing the pan in the beginning with white wine would add a nice touch. But thanks so much for posting it! Made this for dinner last night. Delicious. I added extra Kale and some frozen veggies that I warmed up to bulk up the amount of soup for zero extra points. I only had one cup for a serving and it was very filling. Leftovers for today…great comfort food with a crusty roll. Thanks for a great recipe. 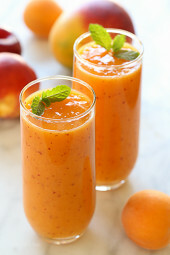 This looks so great, going to make it today! 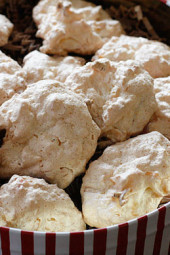 Have made several recipes and they have all been a hit! Thank you so much! when it says "leaves removed from ribs", are you supposed to then trash the ribs, or chop them as well? forgive me if this is a dumb question, i'm completely unfamiliar with kale! Another awesome recipe! Perfect for this chilly rainy weather we're having here! My husband is absolutely loving it, he's asking what's on the menu for tomorrow! =) Thanks so much! Delicious soup. 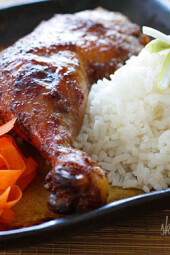 Have tried 4 or 5 recipes from your site and so far all have been a hit!! For this one I sub escarole for the Kale cause that is what I had and also a potato instead of beans because I am breastfeeding and trying to stay away from beans. It turned out delish! Took a little longer to cook with the potato, next time I will probably nuke the potato first then add to the soup. Hubby is not a big soup person and he really liked it. This was so tasty and easy! Thanks! I've been using about 2 recipes a week from your site for the past month as part of my quest to eat fresh and more healthfully. You're awesome! I don't feel like I'm missing out on anything but the calories b/c your recipes are so flavorful 🙂 I tried this one with turkey brats that I took out of the casings..so good! Made some kale chips with the leftover giant bunch of kale. ~Kristen S.
Would this freeze alright? or would the kale go funny or too mushy? Hi Gina, I made this last week and my family absolutely loved it! I substituted veggie meat for the sausage and seasoned it accordingly (my partner is vegetarian) and it came out great! This week I am making your sloppy joes! Soooo delish!! Thank you for your blog and the hard work you put into it!! I had this Soup last night and I got to tell you, WOW it was so Yummy, I did have to add a little Adobo seasoning to it, and that made it PERFECT in my book 🙂 I also used your Turkey Sausage Recipe in this soup, I love that recipe as well. I am so Happy that I found your Page! Gina….do you have the nutritional info for this recipe…..the WW website won't let me input this in my online tracker without it. DELICIOUS, by the way! This was out of this world! i actually found lamb sausages that were 2 for 140 calories, so I used 8 in the recipe, making it the exact same as the turkey meat. The lamb was so flavourful!!!!! huge hit!! This was delicious. I used storebought turkey sausage and threw some onions in with it. A very delicious warming meal. Your website is really helping me in my weight watchers journey (I'm fairly new to it). I am happy I found you. Made this for my family and it was delicious!! I added tortellini for my daughter, made it very hardy!! This ws so delicious! Thank you for posting a great soup that was so easy to make. I loved the link to the turkey sausage, too. What a great site! Scrumptious!! How could I have not know the awesomeness that is kale until now? What a satisfying soup and the sausage is easy to make and delicious! I just made the soup, it was so good! I added a bit of evaporated milk and it reminded me of Olive Garden's Zuppa Tuscana. So glad you liked it Mrs D! This is super yummy! I also added a can of chopped tomatoes and some carrots to have more veggies – delicious! Made this last night, put extra kale, onions, carrots…lots of veggies. This was so great, I made a huge bowl and the two cups fills me up!!! Thanks again for another great recipe! I LOVE this recipe…it is my go-to soup! Thanks Gina! I made this soup last night and I can not believe how delicious it was! It was the first time I have ever had or cooked with kale and it was very good! I used chicken sausage instead because it was lower in fat and calories when I read the label in the supermarket! This is a keeper. Thank you Gina! You are amazing! Do you have the fat/calories/protein/carbs for this one? I just made this tonight…it's so delicious! My husband and I love it. I eat kale often and wanted to use it in a soup that was light and this fit the bill…good stuff! Thanks! Thanks, I saw that on Kalyn's Kitchen. I must try Kale Chips soon!! This soup is amazing! It reminds me of a Portuguese soup called Caldo Verde. I had a lot of left over kale so I did some research on the Internet about what I could make that was easy and came up with Kale Chips which were so yummy! You just pop kale in oven with olive oil and salt and they come out like chips! Great recipes Gina! I made this soup last weekend…delicious!! I never had or used kale before, but it was very good in the soup. I love your site and your recipes! Thank you so much for all your work here! This soup looks very yummy!! Could it be put in the crockpot and cooked on low for a few hours, rather than cooked on the stovetop? Oh my goodness. I made this today for lunch and…wow! I nomally detest kale. Seriously, my husband has been trying to get me to eat it for a long time. This soup, though, totally changed my mind. It was amazing!! Must have been great with bratwurst! Great easy idea!! I made this soup for dinner tonight and my husband & I both loved it! I had to substitute spinach for kale because that's what I had, but I want to try it with kale next time. I used Honeysuckle White turkey bratwurst for the sausage, which was really good. Thanks for all the awesome recipes you post! I just wanted to say that this has become a regular in our house. I usually use beans I've cooked from dry in the crockpot and usually use two cups instead of one. This is such a filling soup! And I absolutely love the kale in it! You're welcome Kristen! Glad I can help! @Laura – So glad you both enjoyed it! This soup was incredible. I made it tonight and my husband loved it! Thank you for providing such delicious healthy recipes. @Thanks Erica and Grandma from Kalamazoo!! @Kate – I've never been to the Olive Garden but I'm sure it would be good with potatoes too! Looks great. Makes me think of my favorite soup from Olive Garden, but with potatoes instead of the beans. Planning on making this for dinner tonight. You have a great site. I enjoy all the recipes as there are so many and they are pointed making it even better. Thanks. Erica Olden said all the things I would like to say to you Gina. I love good food and your recipes are outstanding. You're at a busy time of your life right now and I congratulate you on many levels, especially the wonderful WW recipes. 70 year old grandma from Kalamazoo. I love the photo! That soup looks so delicious and tempting…wish I had a bowl of that now!